Publishing Information: TOON Books, hardcover, 40 pages, 2016, $12.95. 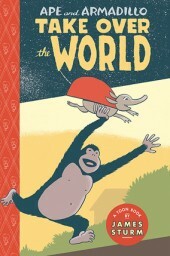 Even before the author himself cites Mo Willems' kid-books juggernaut pairing Elephant and Piggie in his afterword, it's hard not to see his latest from TOON as an exploration of those books and what they do very well. There's a big creature and a little creature, they are truly at odds and truly emotionally invested in the stakes as presented, and the conclusions are more accommodation than changed-reality. I don't know if Sturm is using these TOON books as a way to explore different effects that are prominent in children's literature, but even the most cursory read of this and the previous, Kamishibai-influenced Birdsong reveals a contrast so sharp it makes a loud, cracking noise. It's a fun book, and as much as I can squint and regress a bit and read it through kids' eyes, I think it's a book I would have liked a lot as a kid. Sturm's character-design strengths transfer well to this kind of work. He makes the smart choice of stuffing a lot of comics in here: main storylines, marginalia and add-ons. Perceived value was a big deal for me as a kid -- not the in the price-point way, but that there enough elements in a book for me to want to pick it up more than once. The main thrust of the books is the two pals negotiating hurt feelings over the break between Armadillo's insecurity-driven plans to take over the world and Ape's reluctance to sign up both in part and overall. Where the book struggles a bit is in making these repeat encounters interesting to the reader. A reason Ape becomes more memorable than his friend across the course of the book is because he has a wider range of reactions to various outside stimuli. Armadillo, in contrast, starts and mostly stays a stimulant. I ended up liking Ape enough I was able to take at face value his acceptance of Aramadillo's quirks, but just barely. I imagine it's good for kids to see relationships portrayed between different kinds of beings, I'm just not sure that many of their equivalents will have the narrative immediacy of a short story to make things less complicated.